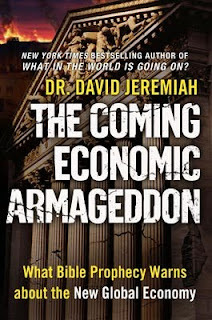 Dr. Jeremiah is a good writer and does a great job of explaining, in sobering terms, how we ended up in the economic mess that we are in; and, more importantly, where we are going. He does so via the science/art of economics and, of course, by understanding God's infallible prophetic Word. My degree is in Business Management and I read a lot about economics (in fact, Peter Schiff's recent book entitled Crash Proof 2.0 is a great book from a secular author that echoes much of what Jeremiah says - though I think Jeremiah's is better since it approaches the subject from a Christian worldview). I have also studied Bible prophecy for many years (and wrote a book entitled Pray That You May Escape that is becoming increasingly popular). I say that to hopefully explain that I especially enjoy the subjects of economics and Bible prophecy and, thus, can write with reasonable authority that David Jeremiah addresses both of those topics exceptionally well. He explains how the world economy is more interrelated than ever. There is also a good presentation of how the Social Security System is little more than a grand "ponzi scheme" on the brink of collapse; and how the economic health of a "superpower" can impact many other areas of a nation, such as it's international political and military influence. A good explanation of how debt at either an individual or national level eventually leads to serious financial problems and that pumping "fiat money" into an economy at the rate we have will lead to inflation is provided. We know that scenario (inflation, wherein it will take a day's wages just to buy food) is predicted to happen in the end times according to Revelation 6:6. Further in the book Jeremiah turns to what he knows best: end times prophecy. As a result, the reader will find a rock solid discussion of how a "new world order" will play a role in the end times, how the Antichrist will be able to control who may buy and sell, the mark of the beast, and other important topics. Readers of his previous books, such as What in the World is Going On?, will find a good bit of redundancy; but they will also see it being explained from a more economic angle. If you haven't read a previous book by Dr. Jeremiah, I think one could jump right into this one and not miss much and, thus, since this one is most current, I would say get this one. In the end, Dr Jeremiah delivers a good book well worth reading and, once again, makes a valuable contribution to the idea that Christians should now, more than ever, learn as much as possible about end-times Bible prophecy given the times in which we live.